We are a small consultancy located in Richmond. We offer advice and support to clients in developing economical, sustainable buildings. 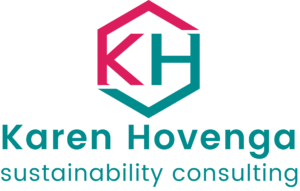 Karen Hovenga, the principal of Karen Hovenga, Sustainability Consulting, is a mechanical engineer with more than 15 years experience. Karen is a NABERS Assessor, GreenStar Accredited Professional and Green Star Assessor. We use bicycles to attend meetings and site visits. When longer distances are traveled we will use public transport to supplement the bike.